Tom Ribe is a contributor to Writers on the Range, the opinion service of High Country News. He is a writer in New Mexico. For example, Trump’s team eagerly attacked the Environmental Protection Agency, the agency that regulates interstate air and water pollution and implements more than 40 years of pollution control laws. Trump’s team proposed a 31 percent cut to the EPA’s budget for 2018. Republicans in Congress replaced his proposed cut with a 1 percent cut in the 2018 appropriations bill. Much of the cut would come from global-warming science programs and from cuts to the Superfund program, which is used to clean up abandoned industrial sites like the Gold King Mine in Colorado. For conservationists, the 1 percent cut is unwelcome, but a 31 percent cut is unthinkable. 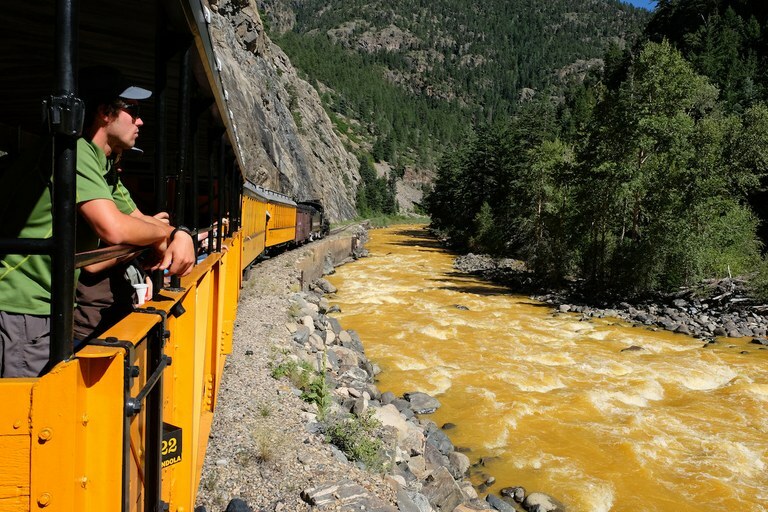 Train passengers traveling on the Durango & Silverton Narrow Gauge Railroad next to the Animas River, less than 24 hours after the Gold King Mine spill. Meanwhile, national parks are experiencing record visitation and many, like Zion and Yellowstone, contend with more visitors than their facilities and staff can accommodate. Some 330 million people visited national parks and monuments last year, contributing $32 billion to local economies. In response, the Trump team proposed cutting the National Park Service budget by 13 percent, a level experts say that would require firing thousands of career rangers and even closing some parks. Congress rejected the Trump cuts and increased the Park Service budget by almost 3 percent. Now, however, the administration wants to drastically increase park admission fees. The Bureau of Land Management was in for a 13 percent cut from the Trump team. But Congress ignored Trump and increased the agency’s funding by 1.3 percent. The U.S. Fish and Wildlife Service, which manages national wildlife refuges and endangered species, is also critically underfunded, with a mounting maintenance backlog and a staff shortage. Nonetheless, Trump’s team proposed a 14 percent cut. Congress, however, increased the Fish and Wildlife budget by about 1 percent. The administration proposed many other budget cuts that would negatively affect the West. For example, his team proposed zeroing out funding for Amtrak’s long distance trains, which would have eliminated passenger train service for thousands of small communities, and not just in the Western United States. Reacting to widespread resistance, Congress rejected the cut and restored funding for Amtrak.